We all know of many great players in the game that do the seemingly impossible. This post isn’t about them. It’s about us. The average player. We don’t spend ungodly days and weeks on one character to make them godly enough to go into an Epic Elite quest alone. We don’t necessarily tune our characters for maximum damage or defense with hard calculations, seeking out the finest gear and running and re-running quest after quest, raid after raid. That said, we average players aren’t inexperienced. We grind long enough to get good Challenges gear. 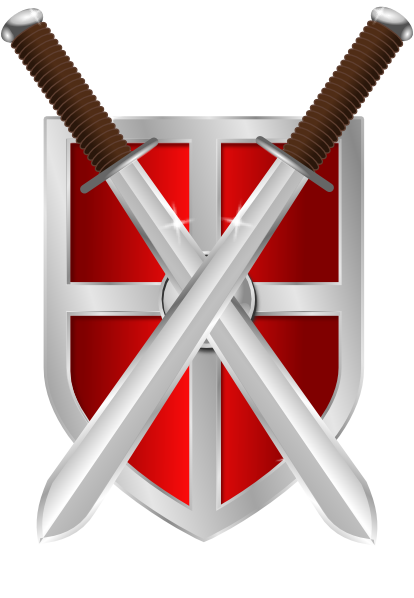 We gather Green Steel ingredients and build very powerful weapons and items. We know our way around Epic quests and have learned through our personal networks (guilds, forums, the DDO Wiki) of good gear combinations. We use the DDO Character Planner and other fine tools. We maximize our Epic Destinies and tool about with enhancements to make solid, if not Godly, characters. And once all that’s done, we “average players” go off to show our mettle. But what places aren’t so often visited by many in the game? These areas might be spurned by the Godlys because they might hold no loot or challenge to them. The Godlys aren’t typically “flower sniffers” (players who enjoy the aesthetics of an adventure, complete some or all optionals, and/or collect ingredients). And there are places that are outright tough. Perhaps the Godlys ignore them because, unlike adventures and raids, these areas have a certain unpredictability and diversity that their characters cannot withstand. And if the Godlys don’t care to visit these places, why on earth would the Average care to go? Maybe, just maybe, we Average go to such places Because It’s There. We want to see everything. We become Tourists of the Damned, taking screenshots of the most dangerous and obscure locations, just to say that we managed to get there (if not return). Often, the developers put small visual treats in these remote locations, just to see if crazy tourists like us would be so nuts to venture out to find and report our discoveries on the forums in appreciation (complete with a photo album). And perhaps there is some loot that we might find while we make the trip. Let’s begin this series of exploration, appreciation and interpretation of little-explored and dangerous areas in the game (from my perspective, anyway) with The Subterrane. If you’ve played “The Chronoscope” raid or were around in early 2008 when the events of the Chronoscope occurred in real time, you know that a Shavarath invasion of Stormreach occurred some time ago that (among other things) destroyed the original Marketplace tent. The devils invaded Stormreach through the use of massively expansive ancient giantish catacombs, deep under the Marketplace and spreading out under some Houses, known to us as the Subterrane. The “Sub” is the game’s only raid-enabled wilderness area. (UPDATE: DDOMicki and FuzzyDuck81 reminded me that that portions of the Cannith Manufactury are also raid zones.) That alone should ring bells. You cannot take hirelings there, limiting many of us Average to maximizing our self-healing options or avoid travel there altogether. The place is filled with some of the nastiest foes in the game. The moment you jump off from the entry point (you did wear your feather-fall item, right?) you’re greeted by several Living Spells that try to snuff you immediately. Think of the names of the nastier spells and put the word “Living” in front of it. Living Meteor Swarms. Living Disintegrates. Living Fingers of Death. Living Delayed Blast Fireballs. As I said, that’s just the entrance. Gather players to Greater Teleport them to Meridia for a “Shroud” run. These players are already in a raid party, and you cannot enter Meridia or any other non-raid instance while in a raid party. Enter to reach Garamol’s Lair in hopes of finding the Icy Raiment outfit or other gear. To enter the Sub for any other reason seems suicidal, right? But where Godlys don’t go, we Averages go, even to say that we went just to say we did. We make up for our Averageness through our versatility. We use anything and everything we know to survive in places like this. We don’t necessarily relish the idea of going in alone but we might take time to study to see if it is possible. In our studies, we might find a secondary reason (and rationalization) to go. In my case, I do like to explore. Now, exploration requires you to either (1) be able to kill anything that sees you or (2) avoid being seen. I use the second option, as many Averages do. Godlys don’t care if they’re seen. In fact, they expect to since they aren’t the types to add points to Hide and Move Silently, I fear. Game tourism is a little like this. Only the woman should really be stabbing the armored guys with the sword and looting their bodies as she gets her photo taken. So, aside from the bragging rights of going, what obscure things might you find in the Sub that can be useful later? Sure, we’re encouraged to pick up these “t-bags” often as our raid groups kill things as we make our way to “Hound.” But what are they for? That’s worth the price of entry alone. Where else, outside of a hireling or divine player, or running all the way back to a shrine, are you going to find a way to help a fallen player? The Ring of the Ancestors isn’t exactly easy to get, and not all of us are Clerics or Favored Souls. These items are certainly easier to farm. The Next Stop: Garamol’s Lair. I make it a point to periodically take Lynncletica the Tanker out to chat with Garamol to farm for the Icy Raiment outfit, especially now that they are no longer bound at all and have improved Dodge numbers after recent Updates. The path to Garamol, through the Central area of the Sub, follows the same path to “Hound of Xoriat.” It’s comparatively safer, as well. Your primary enemies are (after avoiding two Living Spells) ancient giant skeletons. There are three opportunities to enter using portals. There’s a special glowing stylized “G” that indicates which of three portals will take you to the cylindrical lair. The first portal (noted on the DDO Wiki map as “Portal B,”) always goes to the path to the Hound, never to Garamol, no matter what the “G” shows in the floating glyph there. The next three portals are “Portal C” opportunities where Garamol rests. You hope that the first portal C location, not far from B, shows the “G” for a quick entry. If not, your second opportunity is near the Halls of Lunacy. Standing guard there is a Elder Beholder that you cannot avoid easily. If there’s a G glyph, you can head to your right, off the bridge, down to the ground, defeat several Reavers and Mind Flayers to reach that portal. If there is no G glyph at the second location of Portal C, you must continue forward, across the bridge, open the door to encounter very aggressive Tieflings and Bearded Devils. A good stealth artist can open the door and sneak past most of the enemies here to the last portal. The good news is that Garamol’s Lair is always accessible. One of the Portal C locations must be active to reach Garamol. If your first two locations aren’t marked, this portal will send you to Garamol. Note that Garamol’s portal is green in color. All other portals in the Sub are red in color. When in doubt, activate the portal using the nearby rune. A good tourist always packs for the trip. Before you venture into the Sub, bring these items to freshen up, as well as stay alive. Your best undead giant beater. If you got this far, you likely have something that works well against them. 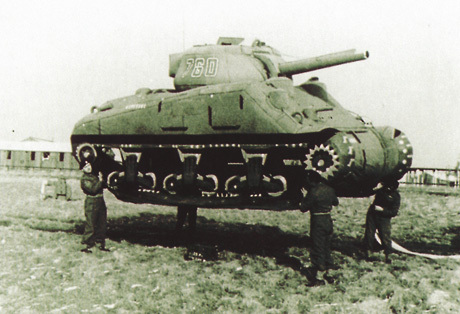 Garamol himself is a 20,000 HP red-named giant that (like many other enemies in the Sub) resist banishing or disruption. Garamol and Lynncletica. Hospitality isn’t his thing. Thank him by spanking him. As you fall, look down and orient the throne of Garamol as the “12” on a clock face. You want to land you and your tourist friends on a rock outcropping at 3 o’clock. You do not want to land on the gold or venture much about the lair. To do so spawns additional giant skeletons and ghosts that will make your job harder. These guys don’t disappear when Garamol is slain. If your group of tourists have the moxy to end Garamol and his friends, you can loot the piles of gold there afterward. You’ll find two chests after dispatching Garamol. One has the chance of giving you the Icys as well as several other unique named weapons. You can leave the lair by recalling out, or use a rune nearby that activates a portal that will take you elsewhere in the Subterrane. Be sure to take a photo of the area, just to show you lived long enough to do so. Gather your friends around the throne and take a seat and some memorable photos of the halflings doing a jig. Always a hoot, that. The lesser-known areas require a bit more fortitude for you to reach. 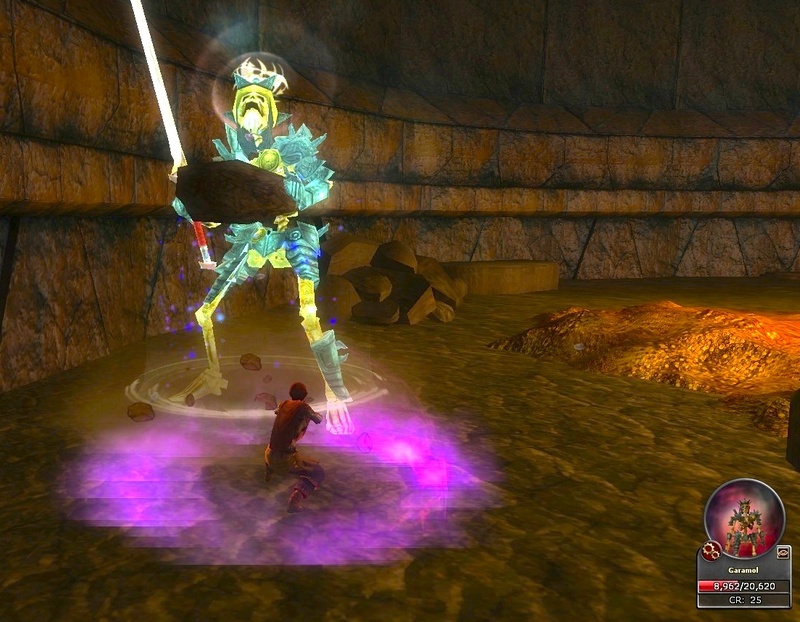 You’ll find several opportunities for rare bosses that might casually give you some history of their invasion of Xen’drik as they slay you. After you thank them for the history lesson by slaying them back, some chests may appear with hopefully useful items. Remember to keep gathering the Planar Shard treasure bags throughout the area. Again, photos of your trip, or it didn’t happen. If you were to backtrack and take the first portal eastward, Portal B, you can see some Shavarath and Xoriat natives milling about, looking for tasty tourists like you. Be sure to greet them back with the ugliest, deadliest weapons you own. This area is generally one-way if you go so far as to unlock the final portal that leads you to a harmless zen beholder that chills near a shrine and the entrance to the “Hound of Xoriat” raid. Next time on the Insane Tourist: The Underdark. It’s no longer a game of Light Monk fisticuffs for most of my game play, of late. My unarmed play of late is generally only with Ryncletica the Ninja, who often enjoys more time with her short swords and shuriken. She now owns a Celestia to go with her Star of Day to dish out some Ninja Poisoning, as well as Antipode handwraps. Quintessica the Mystic almost always uses her quarterstaves, and the latest gift of a free Sireth from the Update 20 Raider’s Box will all but guarantee this fighting style isn’t changing soon. And the star-thrower Szyncletica is looking out for any returning stars to craft while on her way to obtain her Green Steel weapons. She just got a Morning Star shuriken and a nasty Cormyrian power-star. All this weaponizing of my Monks leads me to a mild revelation. Good weapons are hard to find. With a few exceptions with a few non-Monks I own, I generally find the latest handwraps and adapted them to my game play and to the quest at hand. Loot-generated handwraps often fit the needs and there are quite a few named handwraps that work. The Shintao Monks gained the most ease in equipping since they gained much of their own damage reduction bypassing as they leveled. All I needed to do was stack more damage and train each Monk properly for durability. I didn’t have to think hard on my artificer and Arcane Archers since they could get easy DR bypassing options through buffs and gear. I don’t own any Fighters, and my other characters are played too little to gain full attention to some weapon needs at the moment. With Update 19, the world changed. Ninja use of shortswords and shuriken became far superior with the changes to poison, the Dexterity-to-Damage ability of the class tree for piercing and slashing weapons, and Ninja Master’s vorpal effects. The Henshin Mystic uses quarterstaves almost exclusively and deal harsher critical hits with them than any unarmed Monk I’ve owned. And I mentioned (ad nauseum to some of you, perhaps) the need for throwing stars for a Ninja star-thrower. In short, I have been increasingly forced to think outside the unarmed damage framework to the traditional weapon damage and types that many others use. I feel like a noob. The greatest challenge in generating the best damage comes with Szyncletica. She has one attack mode: Shuriken. She’ll only go unarmed for oozes and to bust down doors. Otherwise, her damage bypassing must come from the star (if no other buffs or abilities are present). As she reached 16, she was pulled in two directions: Getting flagged for the Shroud and completing the Lords of Dust chain to reach Eveningstar, completing any challenges there. Each path gains a new weapon: Green Steel from the Shroud and Cormyrian thrown weapons from Eveningstar. Shruiken are harder to build as Green Steel. They need Large Splintered Horns, a rarer item to find in your Shroud ingredient farming. I know I’ll end up paying through the nose on the auction house to get a couple of these for at least two GS stars. The Eveningstar/Underdark challenges aren’t nearly as puzzling as the House Cannith ones in terms of solo play. Thankfully I some guildies and I made it through to Eveningstar and farmed these at-level to get my first Cormyrian star, with acid, Crushing Wave and goodness knows how many other effects, like paralyzing. It’s not all that good on Shavarath or Xoriat enemies, but on everyone else, it’s a marvel. On my very first trip into Wheloon and into “Friends in Low Places,” I scored The Morning Star I can use to help against light-sensitive enemies. I popped a Silver augment in there for now. Vampires hate me. I took Szyncletica into a normal-difficulty “Running with the Devils” to see what she could do. The Eladrin there are often stumpers since they are Good-aligned (making Holy weapons useless), are powerful mages, and need Cold Iron to fully bypass their impressive damage reduction. I had an Aligned star with me, but it wasn’t enough. Switching to a Metalline Flametouched star just pissed them off more than injured them. I crafted up a Cold Iron returning star into an Aligned Cold Iron of Improved Destruction that worked well enough on a a later run. By next Thursday’s guild run into the Shroud, I plan to re-craft a couple of Silver stars to a +5 Shocking Burst Silver star of Pure Good and maybe a +3 Holy Silver star of Improved Destruction. Both will target Arraetrikos and his weaknesses. He has just 50% fortification on Normal difficulty, so I might be able to remove up to 15 fortification with the second star and some AC as well, to make it easy on the melee teams. Harry is vulnerable to electricity, so a Shocking Burst star pinpoints that, too. So long as I can evade the occasional meteor he flings my way (with a very high Reflex, I should do so), I’ll be okay in Part 4 and keep a good distance from others in part 5 when Harry is freer to move. Crafted stars don’t have a wide damage range, unfortunately. Improved Critical: Thrown goes only so far. The Snowstar has a much-wider range but isn’t Good-aligned for better pain. That’s why the higher damage game-crafted Green Steel and Cormyrian weapons are needed as Szyn to improve her overall power in raids. I’ve avoided many halls of the undead with Szyn, including Delera’s Tomb. I can mow zombies easy enough. It’s the slashing-resistant skeletons that are harder to take down–especially with the complete lack of a disrupting shuriken. My new Morning Star shuriken will help there, if a future Cormyrian star’s semi-random effects don’t surprise me with a disruptor. Time to go get my Voice, finally. I’ve never had such a high ability stat on any character, ever, at Heroic level. On a Ninja thrower, the DEX goes not just to damage and attack rolls but determines the percentage of an additional star thrown per attack. That means that Szyn throws an additional star 40% of the time now. It showed in Gianthold as I tested out the change. Poor giants were gunned down at high distance with a Snowstar, most before they could react. Add in Improved Precise Shot and I was culling mobs out there. It’s the Red Fens all over again. In Gianthold, I hope to get a guildmate or two to complete the flagging runs there in hopes of pulling a low-level Ring of Shadows for some blurriness in lieu of yet more Green Steel crafting for a Smoke II helmet with 2-clicky Displacement and permanent Blur for later. Lots and lots of Shroud runs in my future. The additional stars with the higher DEX really improve the effective damage per second of the build. I’m counting on its power in the Shroud. I took the Cormyrian star into “Mired with Kobolds” on Normal. Aside from a bug that prevented me from rescuing Wayfinder Dael, the quest was full of stomp as I blasted things from long range. Then came the dragon. I immediately blasted the crystals in the circular field and began circle strafing everything, dispatching the kobolds and then running alternately small and large circles about the child dragon. Didn’t take long for it to die. I quickly looted…and stopped. I wanted to see what the star could do against something stronger. Out came Mama Dragon, CR21. Off I went strafing again. I didn’t have to change a thing. Strafing means I avoid the damaging breath. Any damage I got came from the briar thorns where my Evasion save hit me with half damage. The hireling kept me healed when it could keep up. It was too busy trying to keep up with me to attract the dragon’s attention and so survived as well. Sinvala could be poisoned, and after a time, 70 poison damage in purple numbers kept punishing her every 2-3 seconds in addition to the spelltouched star’s occasional slams of elemental damage and Crushing Waves. She’s immune to acid, but that didn’t help her. Victory came easily, to my surprise. It’s time for Szyncletica’s first Shroud run. Time to put the metal down. And after 20, its a new ball game. Based on what the Shurricannon build requires, it’s going to be a tough road as she gets Shiradi training completed. Fellow blogger Erdrique has recently posted a series of articles on backstory insights of races and alliances in various adventures that are often illuminating and sometimes puzzling. A stray thought came to mind regarding the Drow. Erdrique has touched on the ones we find in the Searing Heights. Even the weakest of them exudes attitude and weaponized bitterness. They often back it up with numbers and skill. The Xen’drik Drow, commonly aligned with the god Vulkoor, can sometimes be mild allies, as with the peaceful Raveneye Drow in the Red Fens, whose backstory (if you bother to speak with one NPC) tells of their self-isolation after giantish enslavement. But when they or any other Drow have their Vulkoor cheerleader mode on, they are ferocious, as we see in the Demon Sands adventures, especially “An Offering of Blood” where it seems that every desert Drow on Xen’drik shows up to kill you. And then, it gets worse–not for you yet, but for them. The Xen’drik Drow get one-upped by another better-known Drow race from another realm–the Faerun Drow, the dark elves of the Underdark of Abeir-Toril. These Drow enter into the world of Xen’drik by manipulating the Xen’drik Drow to free a senior drider priestess, the Spinner of Shadows, who contacts the goddess Lolth (who makes Vulkoor seem like an orange-named boss). Lolth’s mere “Hello!” when her aspect appears in the plane of Khyber causes an inter-planar rift in Xen’drik that threatens to destroy the planet. It’s a metaphysical attack so intense that it might be like being a grandson and getting slapped so hard by a bully that your grandfather feels it, decades before you were born. One of the most dreaded enemies in their ranks are the Drow Priestesses, powerful mages that will sustain themselves in a fight by sucking the life from anyone in her influence–even her own army. 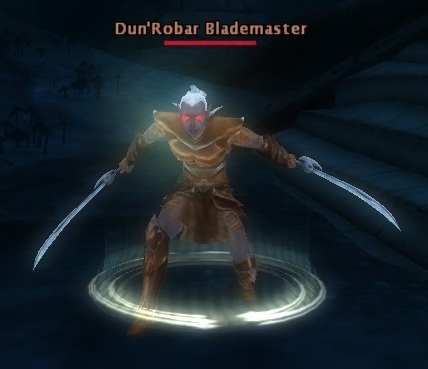 The Drow of the Underdark are more sinister, more battle ready than the Xen’drik Drow. While the Underdark Drow have houses that often fight among themselves, the Xen’drik Drow are often seen in various alliances, most not with your interests and, interestingly, not with other Drow factions. As a result, they seem rather spread out in effectiveness, like the Sulatar Drow of the Searing Heights. The Vulkoor Drow in Menechtarun are arguably the most potent of the Drow on Xen’drik up to level 16. From there, the nastiest ones are found in Khyber. They appear to be Drow who have been influenced by the Spinner of Shadows to gather dragonshards for her. As a result of their alliance, these Drow spellcasters are superior in firepower than any other Xen’drik Drow, if Sabriz Rinzyn Kho is any indication. The contrasts between the Faerun and Xen’Drik Drow made me think of the Klingons, the warrior race in Star Trek lore. At first, these characters were written up as placeholders for Communist rulers of the Cold War, since the Original Series was produced during that time. They were humanoid in appearance then, resembling Asian/Slavic peoples you might find in the former Soviet Union, with a heavy “Fu Manchu” look. By the early 1980’s, the Klingons took on a different appearance, still humanoid but with a more…crustacean appearance, for lack of a better term. These were first seen in Star Trek: The Motion Picture. The Klingon commander at the start of the film was played by the late Mark Lenard, one of the first actors to play a role in all of the non-human major races in the series and films as well as appear in more Star Trek projects than most other actors (The unnamed Romulan commander in “Balance of Terror,” the unnamed Klingon commander in The Motion Picture, and, of course, Sarek of Vulcan, Spock’s father, in the Original Series, Next Generation, and the movies Star Trek III and IV). These “new” Klingons quickly gained a far grandiose warrior-race posture not unlike races we see in the Dungeons & Dragons universes. An artificial language was created for them for use with The Motion Picture by Marc Okrand. It’s now the most commonly spoken artificial language in the world. (Sheldon Cooper tries to use it at any opportunity.) SF conventions always have a contingent of attendees that are in full Klingon apparel–well, the armor from the Next Generation appearance, anyway. They speak of honor and war and battle. They aren’t necessarily evil, but are fearless, continually ready for battle to show their worth. Klingons: Before…and now. For folks playing at home, this is the same character, Kor, played by the venerable actor John Colicos (also of original “Battlestar Galactica” fame as the original Baltar). By their reappearance in Star Trek: The Next Generation, the Klingons had a love/hate alliance with the Federation. Like the Vulkoor Drow, when the Klingons are miffed at you, you’ll have to fight for your honor or be destroyed. If Star Fleet shared the Klingon’s distaste for a common enemy, a Klingon/Federation war party is an awesome force to be reckoned with. The race also gained a substantially greater historical backstory and ethics that showed how a dangerous Klingon isn’t particularly evil–just Klingon. So, when “New Klingons” showed up, it seemed to me (an old guy that’s watched The Original Series when it first aired) that the Original Series Klingons have become jokes to viewers and fans, spoken of only in passing. So it may be also true for the Xen’drik Drow, threatened with perceiving itself as the “New Coke” of the Drow race. 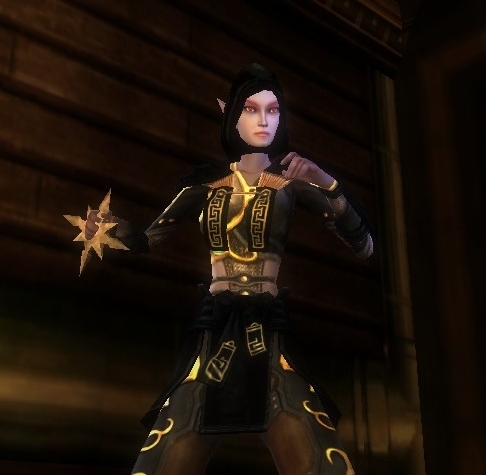 It would interesting to have a new adventure in DDO where players get to explore the history of the Drow, specifically how the Xen’drik Drow are handling the revelation that other Drow in the universe not only exist, but are tougher, badder and have a MUCH bigger god than they do. I mean, Vulkoor isn’t quite up to planet-killing prowess, to my knowledge. Where did these new dark elves come from?, the Xen’drik Drow would ask. Why are they more powerful? What is the fate of the Xen’drik Drow with this revelation of both religious, political and ontological import? What does Lolth have in mind? Is she going to sacrifice the Drow of Eberron to the Demonweb? Given that some Xen’drik Drow aren’t so much evil as they boast superiority (a common Drow trait), it would fascinating to see a Xen’drik Drow show up their Faerun counterparts in some way. 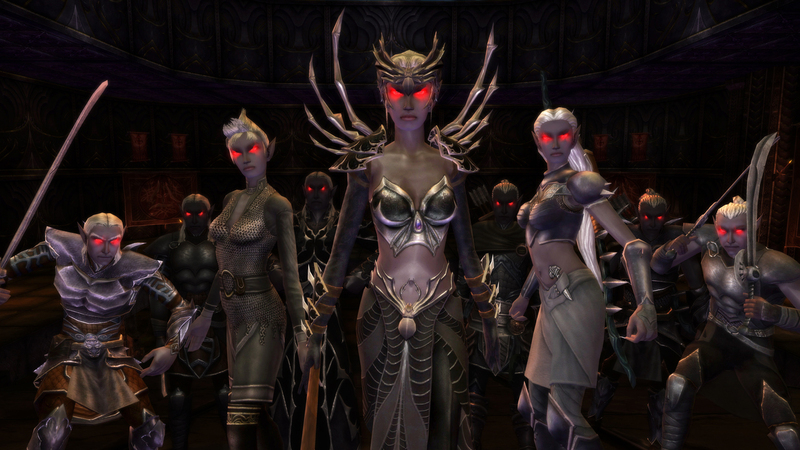 Imagine that the Drow of the Underdark have their eyes set on invading Stormreach. Do you think our Eberron Drow would have any of that? Our Drow wouldn’t fight so much for Xen’drik, but just because they need to save face. They’d go out to prove that they are Drow too, dammit, not some knockoff copies that the Underdark used for slaves once upon a time. The developer’s concentration in focusing on creating more Forgotten Realms adventures and less of Eberron quests make the probability of exploring this new plight to the Xen’drik Drow unlikely. My newest character, the star-thrower Szyncletica, is a House Dun’Robar Drow. So, with some practice, I’m going to play her as an outsider amidst outsiders with some inside understanding of her Xen’drik brethren. She’s going to get annoyed at the relative equality of Xen’Drik Drow men in the quests she’ll encounter (women are the leaders with the Faerun Drow), especially since her backstory is that she was a daughter of a Matron Mother and thus, heir to the throne–if she were able to kill off her sibling competition. I plan to march Szyn into the Demon Sands shortly. I’ll likely choose dialog options that reflect her nature as a Drow. I’m hoping that the developers added a little NPC dialog changes that might make Drow-to-Drow talks a bit interesting. However, it’s not probable given the age of the modules, and my adventures in the Red Fens don’t show any change. I do know one thing. I think Szyn has the cojones to take down the Demon Queen solo, at Heroic level. Her throwing attack can hit fast and hard, her reflexes will save easily against Queen Lailat’s blade-barrier like attacks, the gnolls will not survive and Szyn should be able to kite her way to victory. Szyncletica, my third Ninja Spy, who specializes in throwing stars as her primary weapon, had minor teething pains, all expected. Perhaps I should say that her player had teething pains, primarily since a thrower is a different breed of Monk, like Henshin Mystics. Nevertheless, she’s extremely fun to play and is my current obsession. She’s gained 7 levels since I rolled her up last week. I think she takes down enemies faster at-level than either my Artificer, the semi-retired Arcammedes (my resident crafter) or my Arcane Archer, Pynthetica, now recently TR’d to become a Half-Elf Arcane Archer Monk (just to see how it works). If you’re building one, take note of a few things. You don’t have good kung fu, frankly. With a very low STR (8), you don’t cause sufficient damage for many enemies. It’s good to have some handwraps when some oozes show up, but otherwise your power to damage comes from piercing and slashing weapons since your ninja training uses Dexterity to determine all damage–except for unarmed fighting, where STR still rules. You might also get gravely surprised when you need to carry things (Gwylan’s Stand, Irestone Inlet, Stormcleave Outpost) or open barred doors (Proof is in the Poison, Cult of the Six) and find that your STR is so low that you can’t bust the door down or pull a lever. Getting hit by a Ray of Enfeeblement just once could leave you helpless and unable to even drink a Lesser Restoration potion, much less fight. You must carry and wear extra STR items to give yourself enough carrying capacity, or run with a friend who does have the STR. Switching to Fire Stance will also help. Pull out your shortswords and not your handwraps for close quarter fighting in some cases, save oozes. Shuriken are slashing weapons and they will cause some oozes to break up into several. They’re often resistant to slashing damage caused by stars. They can’t be vorpaled. You’ll need to work on an elemental bane weapon, get really lucky to find a banishing star, or take to some shortswords again. If you’re gathering up returning shuriken and can craft, here’s an opportunity to make an Icy Burst of Greater Elemental Bane star, if you are fortunate to have the skill and necessary ingredients. In “Taming the Flames,” Szyn’s very high Reflex save and Snowstar (Icy Burst) made this quest a breeze with completion of all optionals. You aren’t generating any ki as a thrower. Ranged attacks don’t generate it. That makes trying to use Ten Thousand Stars for a burst of damage a bit impossible with less than 20 ki. That’s why training up the Henshin Mystic ability, Contemplation, to its maximum will give a passive ki regeneration to keep your stable pool filled enough to use this ki ability. WIS is needed for ki quantity, but Concentration is essential. At level 10, you should have +2 passive regeneration that should keep you hale and hearty if you play to the class strengths and stay in stealth to keep the maximum ki regeneration for when you need it. It’s not just for attack for to refresh your HP with Wholeness of Body. On hitting level 12, I gained Greater Ocean Stance, so now I can push to +3 regeneration when the need arises. You’re wielding a shuriken. It’s the lowest base damage weapon in the game (1d2). A dart has 1d4. A Club of the Holy Flame, for crying out loud, has a greater base damage than a throwing star. If we could lob spitballs, I’d imagine they’d do more base damage than a star. Your martial ki attacks also won’t work with ranged attacks. The only damage from the star comes from the star itself and the standard weapon damage calculations based on your stats and enhancements. Your mission is to use any abilities you can to maximize the damage per strike as well as the number of strikes per attack. That’s why the Shiradi Shuricannon build emphasizes DEX for a percentage chance of extra stars per attack as well as using Ninja Spy to gain DEX to damage, foregoing STR for damage calculation. WIS is used with Ten Thousand Stars to boost the number of stars thrown and number of attacks as well. I just learned from the build’s author, Firewall, that Ranged Alacrity effects don’t work with thrown weapons. Pooh. At least Wind Stance helps here, and additional stars per attack certainly do. You have only three named stars. Good luck in getting a star with common but important prefixes such as banishing, disruption and paralyzing. It’s not impossible, but you’ll likely need great luck in getting one. You’ll need to look to challenges and Green Steel for options, as well as some crafting, of course. If you are very lucky, you’ll find a returning star with a red augment slot. Thankfully I have a handful of characters that can run the Vale flagging quests, gather up Shavarath stones and ingredients to make Szyn a GS base shuriken (that only binds to character on equipping), and then have these characters run “The Shroud” to gather ingredients to get her a powerful weapon very soon, before she reaches the Vale herself. With Improved Critical: Thrown now added, the crit range is shown as 15-20. That’s not a typo. It’s still X2 damage, but that’s a very big window of opportunity to generate damage. I’m seeing criticals (wielding a Seeker VI kama) in the 120-140 range–and of course, multiple stars often proc with similar numbers at the same time. Lightning II, Crushing Wave and Greater Disruption stars, in that order, are on my list. On running Threnal with guildies this weekend, I had to craft a Metalline Flametouched Iron Shuriken of Bleeding to penetrate the DR of the many Xoriat Renders there. It should hold me until Green Steel opportunities come about. Damn that I’ll need to get several Large Splintered Horns to make these base items so that she’ll be able to throw Shards of Power at them to complete them. I’ve got one, so I’m hoping to barter a few more from guildmates. And there’s also the Eveningstar Challenges for the spelltouched stars. A high Spot and the right graphics distance renderings means that Szyn can lodge a star in the eyeball of a mephit from hundreds of meters away. Even if I have to throw several stars, it takes more time for something to chase me down than for it to die of multiple stars to the body. By being far out of a mob’s Spot range, you are a highly effective sniper, able to down enemies without attracting any enemies surrounding your target. Using elevation and obstacles to limit the enemy’s ability to reach you is a bonus. A star-thrower completely dominates wide-area wilderness areas (the Devil Battlefield and the Shavarath area of the Vale of Twilight might be exceptions since enemy teleport is common there). Szyn’s venture through the Red Fens with her Snowstar turned the place into a dramatic killing field. Standing still is key to success. The Archer’s Focus weapon stance of Precise Shot builds up cumultative bonuses to attack and damage to magnify the results. Complementing the pelting is the Damage over Time effect of Ninja Poison. We discussed its potency and that of other poisons recently. When enemies start getting purple DoTs, their fate is sealed, even if I’m forced to run. I’ve been combining DoTs and distance to fight orange and red-named bosses, as well as mobs, by dancing around enemies by circle strafing. 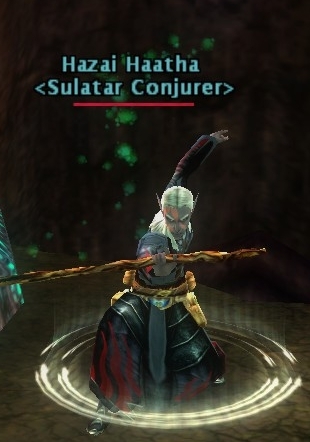 This avoids damage from straight-line magic and melee attacks, leaving Szyn’s spell resistances, Evasion and saves to aid against tracking magic damage. It’s only challenge is having enough room to run about, as well as my own game play in using the right keyboard and mouse controls to keep my hands from cramping. I’ve learned to mix in mouselook mode but I find it annoying since I lose access to my toolbars in this mode. The results, however, are very very pleasing. I’m becoming surprised how few bosses are poison immune, gaining such immunity, if at all, on Elite difficulty. The three bosses at the end of “Frame Work” received catastrophic Ninja Poisoning, as high as 70 points per 3 seconds, that made short work of them. Even the ogre mage, whose kind disappears to regenerate after so much damage, received DoTs while intangible. Some enemies don’t take well to being poisoned. I applied heavy DoTs to Hesstess in Elite “Eyes of Stone.” She returned the favor, I think, with an immediate dose of Medusa Snake Venom that zapped 25 CON off of me, killing me instantly. Szyn knows how to use people. (She’s a Faerun Drow. Duh.) Her primary need for extra bodies, as with some others, is to keep the aggro situated elsewhere while she’s at work. She’s almost always in stealth, recharging her ki and staying out of immediate detection. As her party charges in, she waits for the right moment before she strikes. Sneak attack damage builds up from Ninja training, as well as Ninja Poison. Later, the “No Mercy” ability increases damage against held and helpless foes. She takes to the high ground whenever there is some. She never attacks first unless the distance between her and the mobs guarantees that she won’t pull her target and his friends to her and that the target goes down before it reaches her. If required, she uses her Shadow Veil for invisibility in times where being seen is certain death and to give some incorporeality insurance if fighting is inevitable at close range. The party-as-meat-shield concept isn’t new. But this mode makes it harder for Szyn to solo in that a cleric hireling (needed for healing) isn’t often a good meat shield. They have average DPS and Threat and so-so defenses. Up to level 13, I had a great relationship with Fayden Maelith, a durable L10 Cleric that fights better than she heals but does watch out for me, holds aggro well, and doesn’t bolt or do anything unpredictable. We took on “A Small Problem” on Elite and dominated the tiefling masses. She took aggro and guarded the giant well while I blasted the mages from behind. Lately, Flagon the Cleric and his Blade Barrier has been generally reliable. I’ve had barely more successes than failures in Szyncletica’s ventures through the House Deneith quests. As noted, narrow corridors aren’t as favorable as wide expanses where Szyn can attack from very afar, while strafing or on high. I did a few Three Barrel Cove adventures and dominated them with ranged abilities. In “Guard Duty,” I stood atop the bridge of one ship and blew things away with ease. No crew members died, and I let the Cleric hireling go nuts in fighting, which also helped the crew as she healed them and ignored me. In “The Troglodyte’s Get” and its sequel, “Old Grey Garl,” Szyn could use ninja stealth and distance to kill at extreme range. That final chest in the first quest, guarded by mages, was all too easy since my attacks greatly exceed their spell range or their ability to get closer before they’re slain. I just have to remember not to attack some enemies before their objective activates–it’s a common quest self-bugging situation. But doing quests not quite at your level (even on Elite) is easy to boast about. I’m beginning to hit that wall where weapon effectiveness meets quest difficulty. A return to the Pit late last week was triumphant. There, ninja skills make it easy to get to where you want to go without attracting a lot of attention. Being able to range everything is a bonus. I’ve done something on a pure Monk that I’ve not done before. Szyncletica has put aside her Jidz-Tet’ka bracers in favor of Wind Howler Bracers to gain that occasional sonic damage strike. Since Szyn rarely leaves Wind Stance to keep her throwing speed and DEX up, the Jidz were only adding +10 to Jump, something I need only in cases where I need to jump higher in stealth and its -20 penalty to that skill. So now I realize that the usual Monk equipment isn’t necessarily the most ideal. My AA experience isn’t completely helping since a lot of the functionality that Pynthetica possessed had originated from her AA and Ranger skills and less from the gear. More STR (for carrying capacity) is welcome, but WIS is most needed for improving ki and Ten Thousand Stars. Time to drop a line on the Shuricannon thread for more help. While we’re poisoning pigeons in the park. We’ll murder them (all) amid laughter and merriment. The Drow of the Underdark: Poison-filled Poison Cheesecake and Beefcake with Poison Frosting. And their armor and dresses are to DIE for. Update 19’s changes are far sweeping than any update I’ve experienced in my three years of game play. One of these changes is the significance of poison. Before Update 14, poisoning was merely a nuisance for most players. You’d find and use a Proof against Poison item to give effective immunity to what poisons were out there. Monks gained early immunity to all poisons. Poison was just…poison. There weren’t any variations I can remember from back then. By the time your character’s Fortitude saves were sufficiently high, no one worried about poison again until they reincarnated. And then the Menace of the Underdark expansion appeared and things–that is, players–took on a different shade of green. Poison gained three new variations: Natural, magical and supernatural. Proof against Poison items now only protect you from natural poisons and gave you saving throws against magical poisons based primarily on the Proof gear plus your Fortitude save. As many a player learned quite quickly when fighting the Spinner of Shadows in the quest of the same name, your natural and magical poison resistances and immunities did nothing against the Spinner’s Strong Spider Demon Venom, a supernatural poison that would absolutely kill you if you didn’t loiter around the fragment of the Silver Flame to rid you of the powerful effects. As for my characters, I didn’t worry about poison at all to this point as Monks gained poison immunity. So it was quite the shock when the Spinner’s poison took me down fast and brutally. As I learned later, the Monk’s granted feat against poison, Diamond Body, was reworked with Update 14 to protect a Monk only from natural poisons. Over the last few updates, players were a bit more careful around the Spinner but weren’t that concerned about poison damage from anywhere else. With Update 19, that thinking has got to be changing rapidly. Poison is now a significant and increasingly common damage effect that comes from many sources and forms. Many natural poisons are warded off with a Proof against Poison item, as in the past. These include bites from spiders, spores from zombies, scorpions and bugbears. And then comes the pain: Magical poisons are abundantly found in several enemies. Thankfully, some Monks can take advantage of their own abilities in this realm. (FuzzyDuck81 noted an omission to this article on its first posting.) Thankfully, Poison Neutralization potions and spells rid you of the long-term effects of most poisons and give you temporary immunity from that poison for a time. But it won’t remove existing damage caused by the poison. You’ll need Restoration or Panacea for that. In the past, poisons didn’t take hold as well from enemy attacks. Today, with the delineation of poisons, enemy weapons will deliver specific poisons that primarily target your ability stats. Some of these poisons give a one-time damage effect that reduces that ability until you use a poison neutralization spell or potion, such as from poison traps. If you are poisoned, that familiar greenish “H” appears over your head, telling you that you should drink that potion right away before you’re forced to use some kind of Restoration spell or potion to cure what damaged you. But now some poisons deliver a damage-over-time, or “DoT” effect. As anyone who has or knows of a Cleric and their Divine Punishment spell, a DoT attack sends stacking, cumultative damage as often as it is applied, often causing damage to enemies even if they have run away or when they aren’t receiving any other attacks by your party. Attacks from these enemies will cause a special untyped DoT effect if you are unfortunate in being attacked. Green Dragon Poison: “This powerful and magical poison of the dragon attacks your body.” Can stack multiple times, damage over time effect. The quest “Don’t Drink the Water” has a dragon that delivers this in spades. Drow Weapon Poison: Can stack multiple times, damage over time effect. Found on the Faerun Drow. Anyone that has an Epic character now has experienced the Drow poison effects more and more now. Even if you can absorb physical and magical damage, their poison will eat at you for additional nastiness. Fighter weapons are coated with it. This is especially bad against your hirelings since they cannot react as well to DoT effects. Fire Reaver: You have been poisoned by a fire reaver and may soon suffer additional Strength damage. Flesh Render: You have been poisoned by a flesh render and may soon suffer additional Constitution damage. The ultimate poisons basically kill you by blowing your HP away with DoT effects or a massive cyanide-like shot to your brain to end you immediately. Thankfully, there are only four kinds. The bad news is that you’re likely to encounter every one of them at least once in your character’s life–and one more often than all others. Cursed Contact Poison: You have been poisoned by cursed contact poison and may suffer additional damage until you are cured or you die. This is a curse and a poison effect. Dealt by Glittering treasure near the Horn of Endurance in “The Crucible.” This one’s easy; don’t be greedy. Strong Spider Demon Venom: This spider’s poison is a force of pure evil and unaffected by normal remedies. It’s slow but lethal. This is the unhappiness given to you freely by the Spinner of Shadows. Only the Fragment of the Flame will rid you of it. Weak Spider Demon Venom: This spider’s poison is a force of pure evil and unaffected by normal remedies. It’s slow but lethal. The Spinner’s little friends, the Flame Eater and Bloated Flame Eater spiders, also give off nasty damage that only the Fragment of the Flame can remove. Pit Fiend Venom: You have been poisoned by a pit fiend and may soon die. Poison Injury: Fortitude DC 32 to save. Initially, you get 1d6 CON damage. Untreated, secondary 1000 CON damage. In the past, I don’t think that damage went off as virulently. But now, I’m carrying stacks of neutralization potions, not only for Harry, but for everything. But enemies aren’t the only ones that can dish out poison damage. Update 19 moved the elemental debuffing enhancements of the Dark Monk into the Henshin Mystic tree, replacing them with Ninjitsu, abilities that can (among other things) inject or forcibly remove Ninja Poison, a DoT poison with powerful cumulative effect. Ninja Poison: Target takes 1d4 points of Poison damage every 3 seconds for 15 seconds. The target’s vulnerability to poison is increased by 5%. This ability can stack up to 20 times. On timer expiration, 5 stacks of Ninja Poison are removed at a time. Ninja Poison is delivered only with piercing and slashing weapons of a Ninja Spy. You can also use the core ability, Poisoned Darts, to spit a cone of darts. I’ve not had much success with them as the targeting of these things isn’t very good. Further, anything you hit will attack you, so it’s likely an attack that works only if your enemies can’t reach you while you watch them weaken. You can start your poisoning by using the Ninjitsu ability, Poisoned Soul, to inflict stacks of poison every 6 seconds for 30 seconds. Do the math: It’s 1d4 times 5, or 20d4 that’s sizzling the hell out of what received it, every 3 seconds. By the time an enemy gets the maximum of Ninja Poison stacks (20), the DoT effect is clearly doing dramatic damage. You can also forcibly pull Ninja Poison out for dramatic damage using Poison Exploit, another Ninjitsu ability. 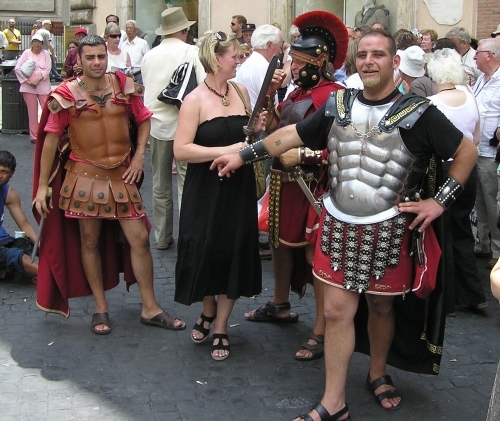 This one’s only useful in prolonged fights–and which fights are those? Orange names, maybe? Later, ninjas gain the Sting of the Ninja, a weapon stance which adds a stack of poison on critical hits from any piercing and slashing weapon, including ranged weapons such as shurikens. All of my ninjas use their shortswords but will be using them more to deliver poison more often. While general mobs aren’t going to live long enough to get its full effect, some persistent enemies could stand a DoT. I suspect some players are “meh” about it since poison isn’t an immediate kill effect. But when you encounter those orange-named guys or red-named bosses that do not have poison immunity, you’ll be glad to have this option. My new Drow thrower, Szyncletica, loves to watch Ninja Poison at work. She can target at a very great distance. As the Ninja Poison accumulates and their vulnerability is increased, the poison damage indicator over the enemy’s head goes from normal to purple damage. With additional stars thrown per attack, the odds of anything getting poisoned increase while Szyn takes little or no damage. And now I’m forcing myself to learn how to circle strafe–running around an enemy or mob, flinging star after star. You’ll recall the giant fight in the 2nd part of “Redwillow’s Ruins”? You’re mobbed immediately by many giants, trolls and hobgoblins. With a Snowstar in hand, I gathered them and spun the mob to death. Strafing like this is all too easy to kill a mob since they often cannot keep up with you and haven’t the AI smartness to try to break out of the circle. But it was physically hard to play it at first. I had to hold down my right mouse button and left button while pressing the forward and a side movement key at the same time. Even with a Logitech gamepad, its brutal to do since I have to move the mouse and pick it up carefully to keep the strafing. Some quick research tells me that the Mouselook key is what I need to touch next time. That’s the one I accidentally touch that ticks me off when my left/right turn keys suddenly go side to side. This way, I should have less cramping and more effective circles, the tighter the better, I think, against single bosses with better speed.